OLDRIGHTIE: When The "C" Word Is Just Not Expletive Enough. When The "C" Word Is Just Not Expletive Enough. Such As This Arrogant Piece Of Smugness. More badly researched tripe. The deluded, brain dead smugness of this woman beggars belief. 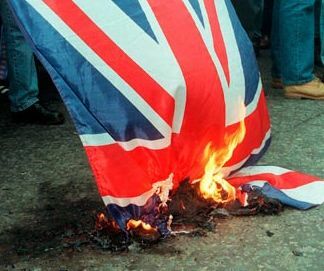 Whilst there are many reasons for the ghastly state of the UK today, none are as a result of my generations' existence. Indeed were it not for the background of our upbringing, that retained for as long as possible family values and a degree of effort to follow Christian teaching, we would be even further down the road of Sodom and Gomorrah the generational products of the seventies wished to take us. The State and socialist sponsored feckless irresponsibility and laziness, the mass import of backward cultures and the incessant marketing drive for selfish, easy, self gratification are but a handful of the 1970s' ever growing fatherless and dysfunctional family breakdown. Led by the celebrity culture, dragged into the Isleworth Courts, in the form of the Saatchi's gross display of a life style of gluttony and greed, our grotesque present generation of "writers" such as Vine do, as their lot have grown up and been spoilt into doing, seek to blame all and sundry but themselves. As with politicians and others in erstwhile positions of authority, the concept of responsibility is a burden, long dispensed with. It may have begun in the middle class and early spoilt brats of the late sixties but the downward spiral of pathetic voting for selfish interests and believing the corporate and marketing trash, churned out to con the people of the late 1970s and onwards are the real seeds of the present day United Kingdom. As I have mentioned, my generation tried and still do, to stem the downward spiral only to be thwarted by the "want it now" credit and debt idiots such as this woman herself. Were I less raw from the loss of one of my generation's good guys, honest and capable of 45 years of fidelity and hard work, I would carry on. I may return to this woman when more able to vent my anger and spleen at her ignorance and culpability. Pathetic bovine and female dog that she obviously is. We were the generation that had been taught by our parents that you should scrimp and save and put something away for a rainy day. We certainly very rarely bought anything on the "never never". (Credit to you youngsters). I personally have paid out of my savings over the years, a small fortune to enable my three kids to get on the property ladder, and the two girls to have very costly weddings. (I'm a romantic old fool). I've torn the article you refer to in the paper out, to use in the toilet. Just to remember what our bog paper was like when I was young.